It’s the end of the cycle, which means it’s time for deadly beast that is “project work time.” each day of the project is like taking a step deeper into a rushing river of distractions and potential side tracks. 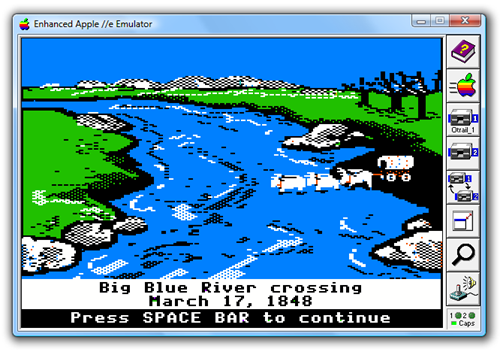 Imagine fording a river, like in Oregon Trail, and somehow get all of my kids across this river. Throughout the project process, some kids inevitably get swept down stream for one reason or another, and I need to catch them and save them, while also making sure all the other kids don’t also get off track, or finish soon and leave everyone behind. So when I think of this metaphor, I have trouble putting my finger on exactly what is making it so hard to get my kids to the promised land. What is this dangerous water that they have to cross? On one hand the river represents time, and the students who get washed away in my attempts to get every one across end up way behind where they should be, and it is almost impossible to catch up. With projects that have sequential parts like the Road Trip Project, the lack of a finished part II, means they can’t really finish part III. They are forced to spend a period neither finishing part II, because they need help, or getting done with part III with the rest of the class, and basically have to come to Saturday school or after class if they want to pass. On the other hand, maybe the river represents content understanding. Those who make it all the way across get the most understanding, but those who get washed down the rapids may be the ones who didn’t really understand the content that we are assessing in this project. They end up with patchy content understanding, and run the risk of carrying that misunderstanding down the river towards the next class where there will certainly be rocky rapids in store. I have a lot of experience with crafting scaffolded supports for my projects to help students avoid not finishing, but the student still may wind up down the river in terms of understanding, and it is hard to know if the scaffolding becomes a life jacket (I wanted to say crutch, but you know, a thing that students depend on more than they would if they were strong enough not to need it). My search for the right metaphor is indicative of my search for a one-shot success project that will always get students to do everything within the allotted time. With our student population, at a transfer high school in New York City attendance is often a huge problem. The projects help to both improve the attendance, while at the same time suffering the most from the lack of attendance. Attendance could be another river which catches students. So, weirdly enough, the person whose lack of attendance was the problem today was me. I spent the last two days at a conference in California and so the kids worked with the subs, although many were not really working. When I arrived back in class, I was afraid everyone would be at different places with the project. Sure enough, when class started I had about 3 or 4 kids asking me “What am I supposed to be doing again?” To figure out where everyone was I made a quick check list of the things that they could have finished, in order from the start of the project, and asked them to check off whether they had done them or not as soon as they walked in the room. This let me know what they needed to do and also let them know what their next steps would be. A number of kid wanted to hang onto the checklist throughout class so they could do all the things on the list. I think I am going to keep the kids on track throughout the project using this check list and hopefully it will become a nice daily ritual as we all try to keep our head above water through project time.